Being one of the leading Exporter, Supplier and Stockiest in the market, we at Jaydeep Steels carry a huge inventory of ASTM A182 Alloy Steel Threaded Forged Fittings which are known for its sturdy construction, longevity, dimensional accuracy, and more. We supply Alloy Steel Threaded Forged Fittings are the best-preferred fittings for installation of pipelines. 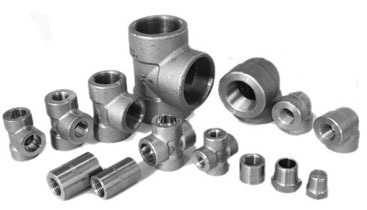 It includes Threaded Forged Elbow, Threaded Forged Tee, Threaded Forged Reducer, Threaded Forged Return Bends, Threaded Forged Stub-Ends, Threaded Forged Collar etc. These AS Threaded Forged Fittings are best suited for sensitive applications in power generation and nuclear industries to handle toxic materials that are harmful to human and animals if leaked. Ensure easy and quick installation of the pipelines, these pipe fittings are available in wide sizes and pressure ratings with choice in surface finish. 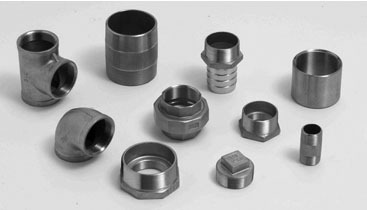 Our manufactured threaded forged fittings are preferred due to its features like durability, high metallurgical strength, tolerance, availability in diverse shapes and sizes, customized products, and cost-effectiveness. Owing to its robust construction and uninterrupted performance, these Alloy Steel A182 Forged Threaded Fittings are widely demanded by clients. Contact us today to request a free estimate today! Jaydeep Steels stocks a wide range of materials and grades. Below is a list of all standard Alloy Steel threaded forged fittings materials and grades we stock. Our experienced team of metal experts will get you the metal you need when you need it. Call us today for your Alloy Steel Threaded Forged Fittings Needs!